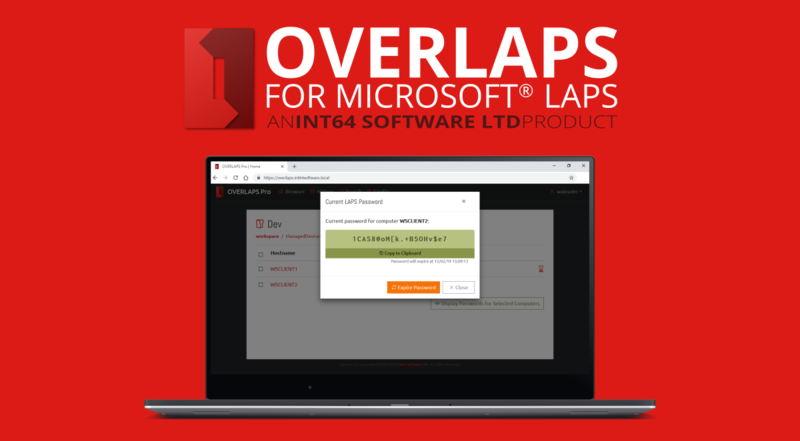 A new minor update for OVERLAPS for Microsoft LAPS has been released, bringing our popular alternative LAPS UI up to version 1.2.2. Continue reading for more information, or head over to the OVERLAPS downloads section for the installer. OVERLAPS is a premium UI replacement for the Microsoft LAPS Local Administrator Password Solution. LAPS is a free and incredibly powerful security tool for Active Directory environments which fully manages the secure randomisation of Local Administrator accounts on your client devices. However, its user interface is purely functional, so OVERLAPS aims to provide a much cleaner user experience with all the same power. This update is available for free to all existing OVERLAPS customers. A bug was reported to be causing problems in some versions of Internet Explorer which limited some site functionality. This has now been resolved and all features confirmed working in IE. To improve the experience in environments where external internet access is restricted, font usage in the OVERLAPS UI has been moved to local storage and no longer requires a connection to Google Fonts to work. This brings fonts inline with all other resources. Under some unspecified Active Directory configurations, forms authentication was failing due to overly restrictive Kerberos settings in OVERLAPS. This has been corrected and now authentication routines should correctly prioritise Kerberos and failover to NTLM if that is not available. Fixed minor web page rendering issues on some mobile browsers. Upon launching the OVERLAPS UI before adding an initial administrator user or group, users will now be warned that they will not be able to login. The trial demo version of OVERLAPS has now been updated to version 1.2.2 as well and includes all of the above and previously published fixes. The free demo can be downloaded from the OVERLAPS page at https://int64software.com/overlaps/about-demo/.